nce again, some of the most talented Long Island musicians from Folk to Rock will take to the stage at the Harry Chapin Lakeside Theatre in Eisenhower Park in East Meadow. East Meadow, NY - July 2nd, 2013 - Once again, some of the most talented Long Island musicians from Folk to Rock will take to the stage at the Harry Chapin Lakeside Theatre in Eisenhower Park in East Meadow to pay tribute in song to the late singer, Grammy Award winning songwriter and social activist by performing many of his classic recordings. The annual Just Wild About Harry Tribute Concert will be held on Monday, July 22nd at 7:00 P.M. Concert goers are once again being asked to bring a donantion of non-perishable food to support Long Island Cares, Inc., the regional food bank founded by Harry Chapin in 1980. In addition, copies of the 2011 recording of the Just Wild About Harry concert will be on sale, which features many of the artists that will appear on July 22nd. The line up of musicians and performers set to appear on July 22nd is still being developed but will certainly include concert organizer and host Stuart Markus and his band, Gathering Time. "This is a wonderful event that all of us at Long Island Cares are always excited to participate in. The public responds very generously with donations of food and all of the artists offer wonderful renditions of Harry's material. We are very grateful to Stuart Markus for his ongoing passion in producing this concert each year to benefit our organization," said Paule Pachter, Executive Director. This year, the Long Island Cares' tent will include copies of several of Harry's CDs for sale and the new CD from Jen Chapin, Reckoning. In addition, several styles of t-shirts will be on sale and information about all of the organization's programs, services and special events will be displayed. SPECIAL TOM AND JEN CHAPIN RAFFLE: Raffle tickets will be sold for a chance to win a specially framed and autographed drum head from Tom Chapin and Jen Chapin, with all proceeds to benefit the Long Island Cares Endowment Fund. 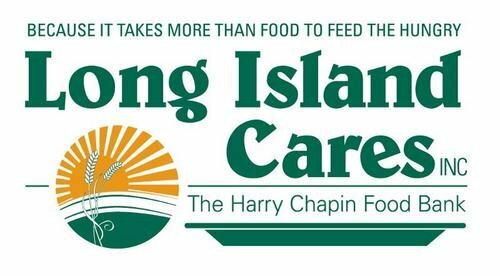 Long Island Cares, Inc. - The Harry Chapin Food Bank is Long Island's first food bank: serving the hungry on Long Island since, 1980. Long Island Cares brings together all available resources for the benefit of the hungry on Long Island and provides emergency food where and when it is needed, and sponsors a wide variety of innovate direct service programs that help families achieve self-sufficiency. The organization was founded by the late singer, Grammy Award winning songwriter and social activist Harry Chapin in response to the growing issue of hunger on Long Island. It is continued today by his wife and partner Sandy Chapin, a dedicated Board of Directors and talented staff working out of their 35,000 square foot facility in Hauppauge and their storefront hunger assistance centers in Freeport and Lindenhurst. Long Island Cares is a member agency of the Food Bank Association of New York State and Feeding America. Long Island Cares, Inc. is recognized by the NYS Department of Health and the USDA as the regional food bank for Long Island. Long Island's 2013 4th of July Guide: Fireworks, Festivities, Food & More! Subject: LongIsland.com - Your Name sent you Article details of "Annual Tribute To Harry Chapin Concert Set For July 22nd At Eisenhower Park"